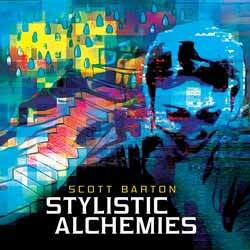 Scott Barton's Stylistic Alchemies is something new and refreshing. It opens with one of the album's highlights, 'Breeding in Pieces' which has an electro indie rock vibe. This is about as mainstream as we get. As the album progresses, it branches out into experimental territory and you'll either go with it, or be totally turned off. From a technical point of view I just couldn't stop listening. Tracks like 'Opus Palladianum - Voice and Drums' bombard the listener with strange sound after strange sound. I was constantly thinking: "what's that?" Which made the track particularly interesting. The album is comprised of 7 tracks (47 min, 41 sec) and one thing is certain... Whether you love it loathe it, you won't have heard anything like this before.